Everyone knows who Kushina Uzumaki is. She is the wife of Fourth Hokage, Minato Namikaze and mother of the main character, Naruto Uzumaki. Kushina Uzumaki was originally from Village Hidden by Whirling Tides but became a Kunoichi of Village Hidden by the Leaves. She became the jinchuriki of the Nine Tails after the first Jinchurikki Mito Uzumaki, wife of Hashirama Senju. Kushina Uzumaki died protecting her new-born child, Naruto from the Nine Tails. In Naruto Online game you can unlock two types of Kushina Uzumaki. Let’s take a look at Kushina Uzumaki’s abilities. Taijutsu & Ninjutsu Loving Pan [Prompt]: Causes damage, High Float and Interruption to a selected unit. If you select a unit from your field, the selected unit will recover Life points and will have all Debuffs cancelled. Ninjutsu Shadow Clone Jutsu: At the beginning of a battle, summons 1 Shadow Clone. When this Shadow Clone uses Standard Attack, it will summon 1-2 Shadow Clones. Taijutsu Loving Pan Heavy Strike: Chases and Attacks Repulsed unit, causes Knockdown and Immobile. Ninjutsu Shadow Clone Barrage: When you have a Shadow Clone of this unit, your standard Attacj will be replaced by a COMBO attack between this unit and its Shadow Clone(s), this COMBO attack will cause Ninjutsu and Taijutsu damage, it will also cause the affected units suffer from Repulse. Ninjutsu Tailed Beast Chakra: Before the first action in a round, recovers Life based ninja’s own Ninjutsu attributes. 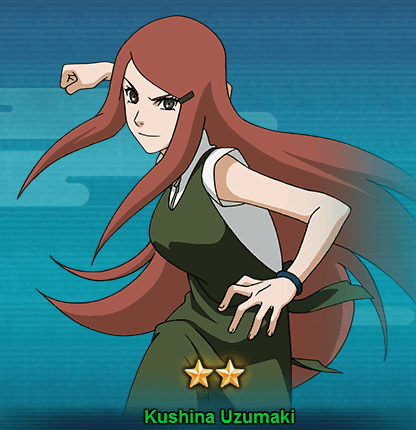 There is a huge possibilities for Kushina Uzumaki to be availabe in monthly signup event.